Oh dear. From the highs of the brilliant midweek victory over Inter Milan, to the lows of yet another poor performance at the Reebok stadium. Is it a mental block? Many say that it can’t be as the players are different, etc, but Bolton certainly seem to be a bogey team for us. Sandro receives the ball from Gallas and, whilst he has limited options, he can either go to Kaboul, Hutton (although he does have a player nearby), or back to Gomes. Instead he dallies – Bolton pressed us high up the pitch for large periods of the game, and Muamba wastes no time in making a challenge here. Quick thinking from Elmander – he spots Davies and plays it quickly. Davies was offside when the tackle was made, and is still offside when the pass is made. It’s a bad decision from the officials, but I don’t think it would have changed anything – Bolton battered us at times in this game. Davies takes it early, and seems to catch Gomes unaware. He gets a hand to the ball quite comfortably, but fails to get it around the post – I think he’ll be disappointed with this one. Bolton are very hard done by with the “long ball” tag – yes they use Davies’ strengths, but they also play plenty of football – they even did so under Megson. This goal is a great move, and we couldn’t cope with the passing and movement. Lee knocks the ball down the line for Taylor, who waits for Elmander to make a run off him. It’s a well-weighted pass from Taylor, allowing Elmander to cross first time. 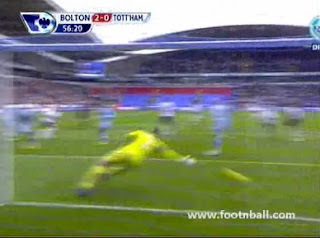 Notice Steinsson at this point – edge of the box and totally unmarked. It’s a great first time cut-back from Elmander. Assou-Ekotto has spotted the danger too late. Steinsson takes a touch to set himself, and rifles it beautifully into the corner. No blame on Gomes for this one – it’s a fantastic strike, lovely technique. William Gallas – so good in the week, so bad yesterday. It seems he can’t go a league game without being directly responsible for at least one goal. This is horrendous. It’s a long ball down the line from Zat Knight, and Davies chases. 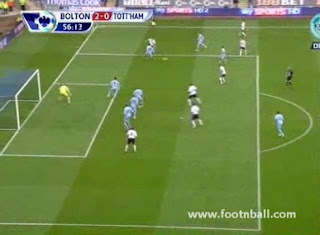 Gallas is well in control, and with two Bolton players nearby, should be putting this into the stands. He has the opportunity to put it into touch with his right foot, but instead chooses to drop the shoulder and take it on his left. He passes out with his left without looking – expecting one of our midfield players to be there to receive. The ball comes out instead to Taylor, who collects and waits for support. Lee has made a supporting run, and is goal-side of Assou-Ekotto, who has been caught napping. You just can’t risk these sorts of challenges – Assou-Ekotto goes through the back of Lee, and it’s a clear penalty. Davies steps up – a nice height for the keeper perhaps, but tucked far enough into the corner. After finding two beautiful goals to drag ourselves back into the game, we allow Bolton to see it out comfortably. 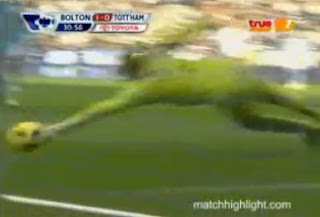 Bolton take advantage of cheap free kicks to keep the ball into the corner. However, in stoppage time we have one slight opening. 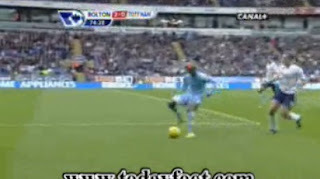 A hopeful ball forward, and Gallas seems to be through – he has the edge on the Bolton defenders. But he doesn’t have the pace that he used to – something I’m not sure Redknapp has realised – and Holden easily dispossesses him with an excellent sliding tackle. Cahill looks up, and spots an opportunity to counter. It’s a well flighted ball out to Davies, and Petrov anticipates that Davies will beat Kaboul, and makes a run inside him. So intelligent from Davies – he angles the ball perfectly inside for Petrov to run on to. Instead he just waits for Gomes to make the first move, and lifts it over his legs. Sandro and Palacios were really, really poor for us in the middle of midfield, and Kranjcar was anonymous wide on the right (where, incidentally, I don’t remember him ever having a good game for us). I am starting to wonder whether Palacios and Kranjcar are really appropriate squad options – neither seem to have the natural fitness of a Jenas or Bassong, and both struggle when brought in for the occasional game. Crouch once again offered no goal threat and, despite his 3 assists in the league this season, I would still personally opt for Pavlyuchenko in most league games. Defensively, we were a shambles. There were individual errors from each of our defenders throughout the game – twice in the first ten minutes, for example, Hutton let Taylor get goal-side of him, and get shots away. Gallas was dreadful for much of the game – unable to cope with the aerial prowess of Davies, and direct, powerful running of Elmander. Thankfully we don’t have long to wait before we are back in Premier League action again, and we have two winnable home games in a row – Sunderland and Blackburn. We must ensure that we get the six points no matter what it takes. Really surprised by Harrys selection. Palacios and Sandro? We only started to play once they went off. I'd prefer to see Kaboul and Bassong play premiership games. Leave Gallas for CL, he just can't cope with the pace of EPL. 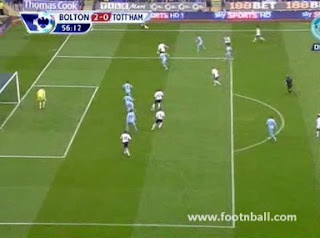 Ref allowed Bolton to get away with a lot, but we were crap and deserved nothing. I think that this result was clearly down to team selection and Harry has to stop messing about. He can't just pick players because he feels sorry for them, he needs to think of the needs of the team. I don't think that either Crouch or Modric are renowned goal scorers, so where did he think that goals would come from yesterday? And why suddenly pair Palacios and Sandro in the middle. Why complain that we were too open in the second half, when Harry was responsible for this by replacing Palacios with Pav. Finally, Pav and Crouch don't work together. How many times does Harry need to see this before the penny drops. 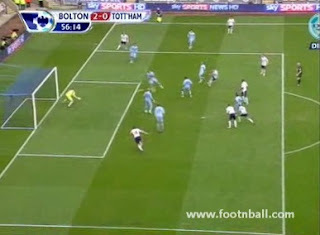 Er, wasn't it Kaboul who gave away the penalty? I totally agree we deserved nothing,Bentley done well when he came on and 2 sublime goals from Hutton & Pavlyuchenko,Bale had a good effort from a free kick,tell me one thing how did steinsson not get sent off for the hack on Bale! He totally took him out,come to think of it so did that thug davies! ...and what about Huddlestone on Elmander. No intent there then? I think that Huddlestone has a tendency to be a bit hot headed sometimes. However, player retaliation generally results because refs aren't giving protection. 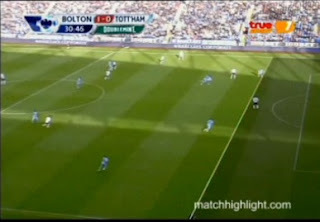 Bolton committed some atrocious and dangerously aggresive challenges that went unpunished yesterday. Huddlestone stamped down as he jumped to avoid another reckless challenge that was clearly aimed at man and not the ball. Harry should take a leaf out of Wenger's book and start to make more noise about the thuggery in the premiership at the moment. It is noticeable that we do much better against other teams, like Inter, who are also interested in playing football. But shouldn't referees be trying to encourage this attitude rather than turning a blind eye to the overly aggressive tactics that some teams use to make up for their skill shortage. boo-hoo. Dry your eyes and go play basketball! Anon @ 11:01 - Totally agree re: Gallas, he's made mistake after mistake. Time for a spell on the sidelines. Block 39 - Sad but true! Brian mad tottenham fan - Absolutely agree - got to win the second balls, and have a man either side of him to restrict him where possible. Anon @ 11:38 - Agree, Pavlyuchenko should have started this in the absence of Defoe and van der Vaart. Anon @ 12:02 - Nope, Assou-Ekotto. 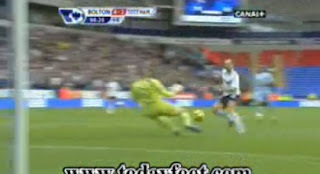 Aon @ 12:51 - ...it was bad from Huddlestone, and he may get a retrospective ban. I thought Harry had it right, until the game actually started. A friend of mine said that 2 CDMs was a bad idea and I should have agreed with him. should make visits to the Reebok much easier.